The discovery of seven Earth-sized rocky planets—three of them having oceans and perhaps teeming with extra-terrestrial life—has created media buzz. The research team, led by Michaël Gillon of the University of Liège in Belgium, used the TRAnsiting Planets and PlanetesImals Small Telescope (TRAPPIST) at the La Silla European Souther Observatory in Chile to detect this extrasolar planetary system, orbiting around the dwarf star, TRAPPIST-1, and located 39 light-years from Earth. Orbits of TRAPPIST-1’s seven plant system are compact, yet they are not roasted wastelands like Mercury. Astronomers estimate that the 500 million-year-old dwarf star, TRAPPIST-1, is just a bit bigger than Jupiter and about 2,000 times dimmer than the Sun. Further, of the seven planets named TRAPPIST-1b through h in order of their distance from the star, researchers have deduced that the outermost three planets—e, f and g—are in the Goldilocks zone and hence “could harbour water oceans on their surfaces, assuming Earth-like atmospheres”. 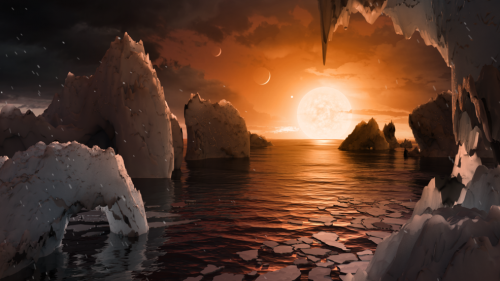 Planets located in the “habitable zone”, nicked named “the Goldilocks zone,” where the radiation levels are neither sweltering nor frigid, permitting liquid surface water and life are of great interest to exoplanet hunters. Due to fortuitous cosmic geometry, the orbital plane of the seven planets was facing Earth, and the view of the star from Earth, was partially obstructed by the planets when they come in the straight line. Gillon’s team noticed the periodic dimming of the TRAPPIST-1’s brightness, and subsequently, used the advanced Spitzer Space Telescope for 20 days and witnessed 34 transits. Modern telescopes can detect even the reductions in the brightness of a star of the order of 10 parts per million, which is as hard as identifying a fly sitting on your window from a distance of 30 kilometres. By measuring the magnitude and duration of the reduction, the team computed that the closest planet takes just a day and a half to complete an orbit and the most distant just about 20 days. It was found that the six inner planets are locked in an orbital resonance, due to regular gravitational influences on one another. Like Moon’s only one face is turned towards the Earth, due to tidal locking only one side of each planet always faces the sun; while the other is stuck in constant darkness. By measuring those influences, the team also determined the mass of the planets, which in turn, allowed them to loosely calculate densities indicating the rough composition of how much iron, rock, water and gas the bodies contain. Located in the Goldilocks zone is a prerequisite, but not sufficient for hosting life and water. Mars located in the Goldilocks zone neither harbours liquid surface water nor life due to the absence of adequate atmosphere. It is the assumptions of Earth-like atmosphere that leads to inference about water and life, and we lack direct evidence. NASA’s James Webb Space Telescope scheduled for launch in October 2018 would be able to look for tell-tale signs of composition, atmosphere and potential bio-signatures such as ozone, oxygen or methane. Finding a hospitable planet about 39 light years from Earth is not an exciting prospect for packing our bags and going on a cosmic voyage. So, why are astronomers so jubilant over this discovery of rocky plants, which are so far that it would take more than 40 years even if we travel at the speed of light? First and foremost, finding Earth-like planets will teach us more about our own planet. We can take bacteria in a Petri dish and watch out the reaction it has with various chemicals. The extra-solar system is an ideal laboratory for studying distant worlds and could be the best place in the galaxy to search for life beyond Earth. During the dark ages, we thought that all the planets, Sun, Moon and starry celestial sphere rotated with Earth at its centre and placed Man at the top of the “ladder of life’”. The Indic religions went one step further and even created a hierarchy, Chaturvarna, and accorded a special place to one set of human beings above others. The Copernican revolution unseated the Earth and put the Sun at the centre of the universe. Bruno was martyred at stake for claiming stars are nothing, but distant Suns, and they may also host planets which may have extraterrestrial life. Subsequently, we have known that the solar system is not at the centre of our galaxy, milky way; nor is the milky way at the centre of the known universe. Evolutionary theory established that the humans, products of billions of years of aimless evolution by natural selection, replaced the idea of humans, especially formed by God’s hand in the Garden of Eden. Ultimately, the quest for “ExoEarth orEarth 2.0” is a search for evidence for “Mediocrity Principle”, which holds that the cosmos looks and behaves the same no matter where we point our telescopes, and that neither earth nor the solar system is anything special, a central tenant of the modern cosmology.